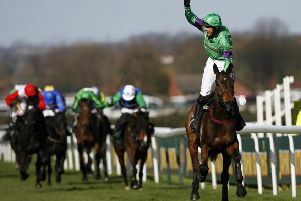 Last month’s Cheltenham Festival was considered to be one of the best ever, sprinkled from first to last with good-news stories, raw emotion, and a series of stirring finishes. But for those most closely involved with Champion Hurdle favourite Buveur D’Air and much-fancied Gold Cup contender Kemboy it was a miserable anti-climax, high hopes dashed almost as soon as their races began. Buveur D’Air’s fall at the third flight in the Champion Hurdle helped pave the way for a result nobody could have predicted and was a bolt from the blue in its own right. Nicky Henderson’s eight-year-old had jumped more than 150 hurdles in public and countless more practising at home and, though not always foot perfect, had never taken a spill. If there is an upside to that first tumble, Buveur D’Air turns up for the Aintree Hurdle this afternoon fresher than Melon and Silver Streak, pushed to their limits in vain pursuit of the easy Cheltenham winner Espoir D’Allen, who sidesteps this one. This is, though, still a big test. Faugheen, now 11, may not be the machine he once was, but is still capable of shaking up the best if on song, while the mare Verdana Blue has beaten Buveur D’Air once already this season and would be dangerous again if the rain stays away. Kemboy got no further than the first fence, a huge frustration for trainer Willie Mullins (soon forgotten when Al Boum Photo finally laid his Gold Cup hoodoo to rest). He befell the same fate in last season’s Irish Grand National and his jumping has been an issue in the past, but when he gets it right, as he did when slamming Grade One rivals at Leopardstown in December, he is one smart operator. Ruby Walsh, who takes over in the saddle from Mullins’ nephew David in today’s big chase, the Betway Bowl, is optimistic. That’s a big tip from the master rider, but even so, I suspect Clan Des Obeaux may beat him. Paul Nicholls’ gelding also came of age over Christmas when winning the King George VI Chase at Kempton, and I think today’s track and trip will suit him better than Cheltenham, where he didn’t appear quite to stay. We should not forget Bristol De Mai (an honourable third in the Gold Cup), although we often do and sometimes to our cost. It’s just that Clan Des Obeaux’s best form this season gives him the edge. This famous three-day Grand National fixture begins with a real treat. La Bague Au Roi, a free-running, bold-jumping mare, bids to extend her unbeaten run over fences to five when taking on the boys in the Manifesto Chase. Her opponents are all quality novices, but La Bague Au Roi, held back for this because her trainer Warren Greatrex didn’t think Cheltenham would suit, seems to have a bit extra in her locker.